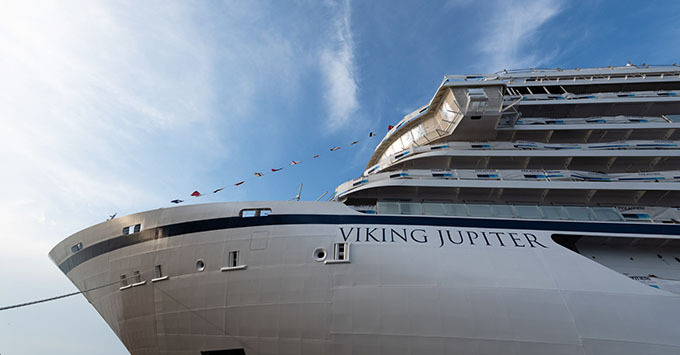 (11:33 a.m. EDT) -- Viking Ocean Cruises' sixth ship, Viking Jupiter, took to the water for the first time today at the Fincantieri shipyard in Ancona, Italy. The official float out ceremony was attended by Torstein Hagen, the cruise line's chairman, and Giovanni Stecconi, the shipyard's director. As part of the float out, madrina (or godmother) Sissel Kyrkjebo, a Norwegian singer, presided over the traditional coin ceremony, in which a silver dollar was welded to the ship's top deck. Viking Jupiter is scheduled to debut in February 2019, as a 47,800-ton ship carrying 930 passengers -- the same as Viking's other ocean ships. It will feature advanced energy-saving technology and modern safety systems. Passengers are more likely to notice Viking's signature features: a Nordic thermal suite open to all, the airy Wintergarden and indoor/outdoor pool area, smartly designed cabins and an array of restaurant choices. The ship will spend its maiden season in Europe, both the Mediterranean and Northern Europe, and will offer two new-to-the-line South American itineraries. Before Viking Jupiter's launch, Viking Orion will make its grand debut in June 2018. The cruise line also has options to build 10 new ships with Fincantieri between 2021 and 2027, and two "special" ships with Fincantieri subsidiary Vard in 2021 and 2022. The latter are being touted as innovative ships that will adhere to the most advanced safety and environmental standards.